On the campus of the University of Notre Dame. 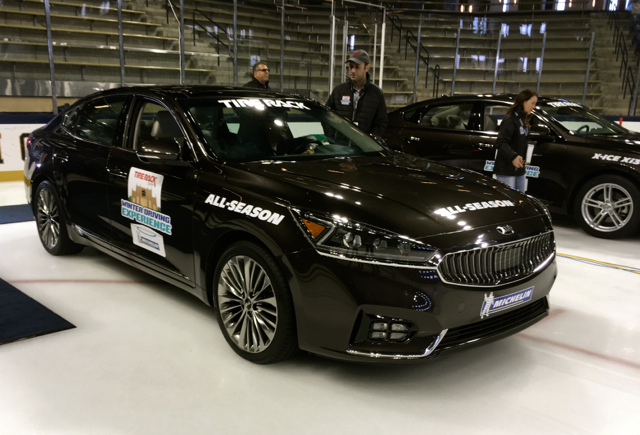 Kia Cadenza sedans on ice. One fitted with all-season radials, the other with winter tires. Think “winter driving school” and you might imagine yourself navigating switchbacks in the Rockies on studded tires or with all-season radials wrapped in chains. Indeed, how else might you learn whether a four-set of Michelin Pilot Alpin PA3 tires will you keep you planted as you peer cautiously over the slimmest of all guard rails — the only thing separating you from a craggy precipice and an 8,000-foot vertical drop below? Well, winter driving school can also be conducted indoors and while the experience is certainly different from outdoor programs, you can learn a lot about tire safety, including just how well winter tires work on icy roads. That’s something I learned recently when Tire Rack and Michelin teamed up to present a winter driving program on the grounds of the University of Notre Dame in South Bend, Indiana. And despite an unusually humid and hot September day just as summer was giving way to fall, a team of journalists managed to experience treacherous driving conditions within the chilly confines of the Compton Family Ice Arena. No, this wasn’t “Disney on Ice,” but something entirely different — the opportunity to compare two Kia-supplied products — Sportage SUVs and Cadenza sedans — and how each vehicle operates on the ice when outfitted with either OEM all-season radials or Michelin winter tires. Yours truly with 2018 Winter Olympic hopeful, Tom Howell. But first, some context about the event. When approached by a PR representative about the experience, I realized I was very familiar with the Michelin brand, but not so much with Tire Rack. A few years back when replacing tires for both vehicles, I went with two complete sets of Michelin radials, purchased at BJs, not Tire Rack. That I could have had tires shipped directly to my home never crossed my mind. Even if it had, I’m sure I would have thought that such shipments were limited to specialty tires and wheels, but I quickly learned otherwise while in Indiana. Tire Rack is the largest distributor of tires in the US and is also headquartered in South Bend. On the other hand, French company Michelin’s North America headquarters is located in Greenville, South Carolina, where they also manufacture some of their tires. Michelin is an important client for Tire Rack, but they also stock tires from more than two dozen other brands, including Goodyear, Bridgestone, Hankook, Continental, and Cooper, to name a few. BF Goodrich, owned by Michelin, is another Tire Rack choice. The evening before the main event, our hosts treated us to a tour of one of the most important shrines on Notre Dame’s campus — that hallowed place wasn’t the Basilica of the Sacred Heart (a tour of the basilica was held separately the next day). Instead, our hosts pushed all the right buttons and used their pull to fling open the gates of Notre Dame Stadium just for our group. 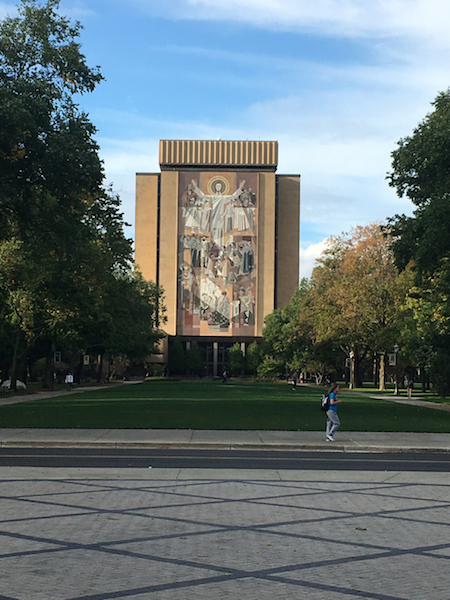 visible from Notre Dame Stadium. What a pleasant surprise this was for everyone present, myself included — I grew up hearing tale after tale about the Fighting Irish from my Roman Catholic family and community. 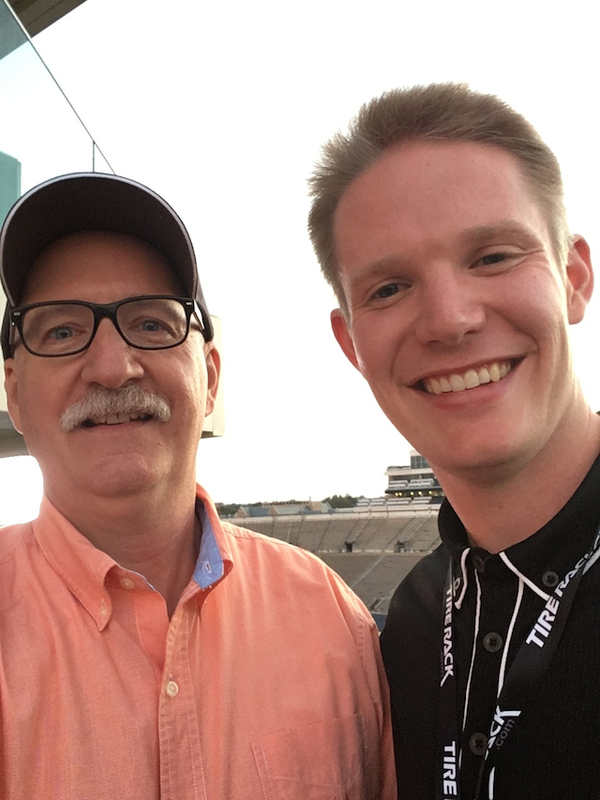 Many years later and I found myself at Notre Dame, standing on the same field where such legends as Knute Rockne, Joe Theismann, Raghib Ismail and Joe Montana had coached or played. While we were still consuming our appetizers, Michelin and Tire Rack introduced a celebrity of sorts — none other than Tom Howell, a 22-year-old man from New Jersey vying to represent the US men’s curling team at the 2018 Winter Olympic Games in PyeongChang, South Korea, next February. The affable Howell shared everything about the sport, including its origin, how the game worked and explained what the screaming teammate phenomenon was about. It turns out the hollering on ice has everything to do with giving players instructions as the 42-pound stone slides across the surface with sweepers working feverishly to ensure the rock comes to a rest in its proper place. Curling may be the the most misunderstood of all Olympic sports — the next day Howell provided us with an on-the-ice demonstration, removing much of that frozen mystery. 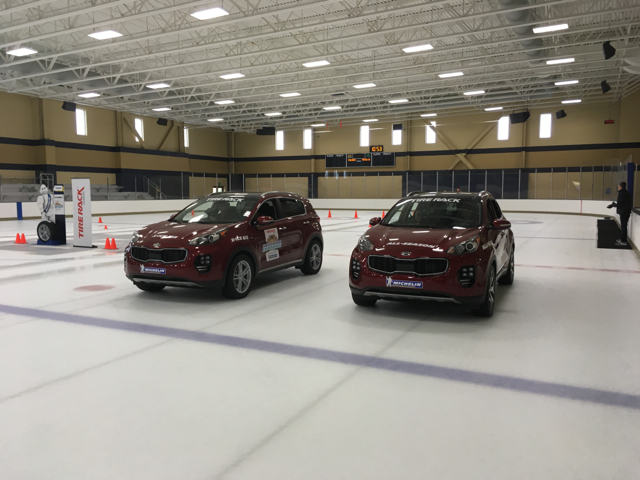 These Kia Sportage utility vehicles were also tested at the Compton Family Ice Arena. So, do you really need winter tires where you live? That was the general question as well as the overall thrust of what was officially known as the Michelin/Tire Rack Winter Driving Experience program. For starters, if you live in Florida, Southern California or in any place in the US that never sees snow or experiences winter conditions, then that answer is clearly no. At the same time, if you live in an area that’s regularly assaulted by winter’s fury, then the answer is yes. But there is a huge middle ground where winter tires can still prove beneficial and that’s in locations where average temperatures fall below 44 degrees Fahrenheit. We learned that winter tires are much more than snow tires as they provide improved grip on icy roads. Ice may form at 32 degrees, but it can hang around during warmer temperatures. Hit a patch of ice on radials and you may be in trouble. 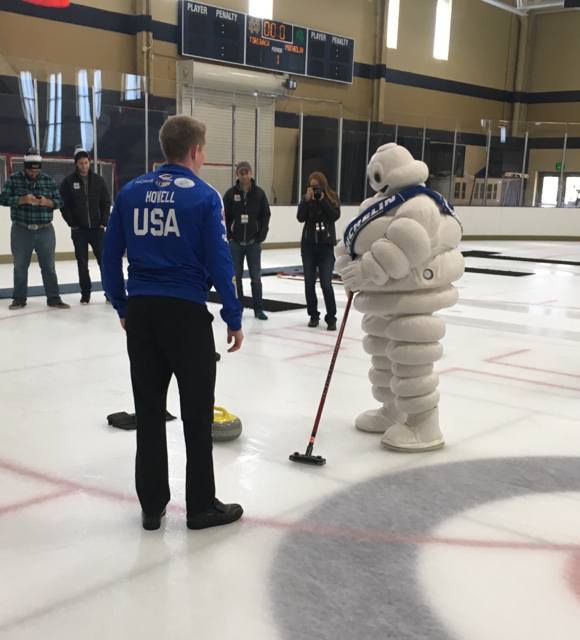 A touch of irony: Tom Howell gives Michelin Man pointers on how to play on ice. Contrast that with winter tires placed at all four corners and you stand a far greater chance of avoiding a dangerous spin. In all road conditions, winter tires provide shorter braking distance on a variety of winter driving surfaces, ice included. You can thank the science of improved tread pattern design and technologies for the superior grip as well as tread compounds engineered explicitly to handle snow and ice. And unlike snow tires of years past, winter tires are fine to drive on dry surfaces and at highway speeds — just install them on all four wheels to ensure even handling and ride comfort. So, driving on ice is nothing new for me, although now that I’m living in central North Carolina, ice is a relatively uncommon event. Still, when it does arrive, I know to stay home — local roads are treated, but not as well as in my native New Jersey, which is firmly in the “get winter tires” belt. Wheel and tire combinations wrapped and ready for shipment. 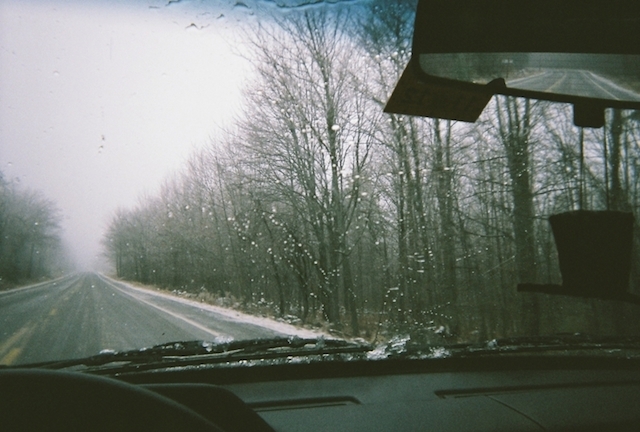 Driving on an ice rink was something new for me and I hadn’t been on a rink of any sort since I was young. Our multiple tests involved driving SUVs on one rink followed by sedans on the other rink. One each of the two pairs of vehicles came with OEM tires (Kumho) — specifically radials — with the other two shod with Michelin winter tires. Through our various driving scenarios, we were able to judge for ourselves just how well (or poorly) each tire type handled in a variety of driving situations, including acceleration, braking, and cornering. Most impressive were the shorter stopping distances of the winter tires, what will prove especially helpful when driving in heavy traffic on slick wintry roads. Notably, the front-wheel drive Cadenza equipped with radials got off to a faster start than the winter tires, then followed by significant fishtailing. Keep in mind that you are not purchasing winter tires for performance, but for driving safety. One further note: Michelin recommends rotating your tires when you swap out your radials in the fall and again in the spring when you store your set of winter tires. 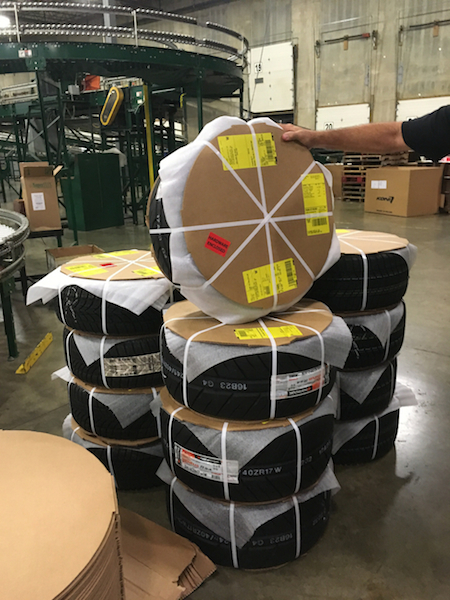 I would be remiss if I failed to mention that our South Bend adventure concluded with a trip to the Tire Rack headquarters and warehouse where we witnessed firsthand how tires are distributed. Not to mention men were on forklifts nearly everywhere — moving pallets, pulling orders and sifting through stock. Specialty wheels, including some already set within tires, are also part of that stock. The grand finale, though was the behind-the-scenes tour and driving experience of Tire Rack’s own test track. 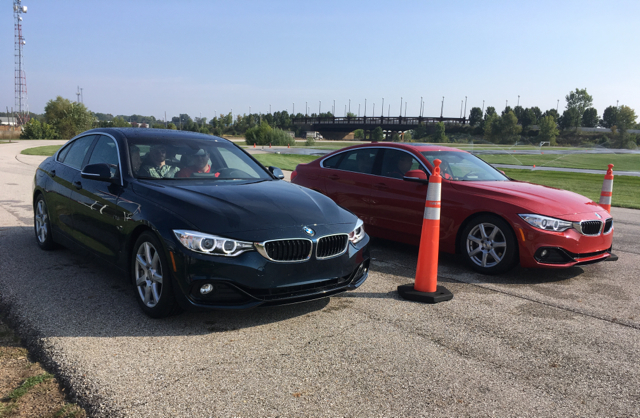 A pair of handsome BMW 435i Gran Coupes were on hand with instructors behind each wheel. After a brief lap orientation, we enjoyed our own wheel time. Did I say the tracks were wet from soaker spray? They were, which only added to the experience. Switchbacks, slaloms and tight corners beckoned, inviting us to push each Bimmer to the limits, supplying a fitting conclusion to this Michelin/Tire Rack event. Track time on the very wet Tire Rack track. Disclaimer: The cost of this trip was funded by Tire Rack and Michelin, who provided air transportation, food, lodging and swag.